It stretches from Europe in the west to the Pacific Ocean in the east, and from the Arctic Circle in the north to the deserts and plains of Central Asia in the South. 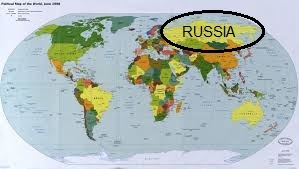 Russia is so big in fact, that the UK would fit inside it nearly 70 times over! The largest country in the world is also home to the longest railway in the world: the Trans-Siberian Railway. 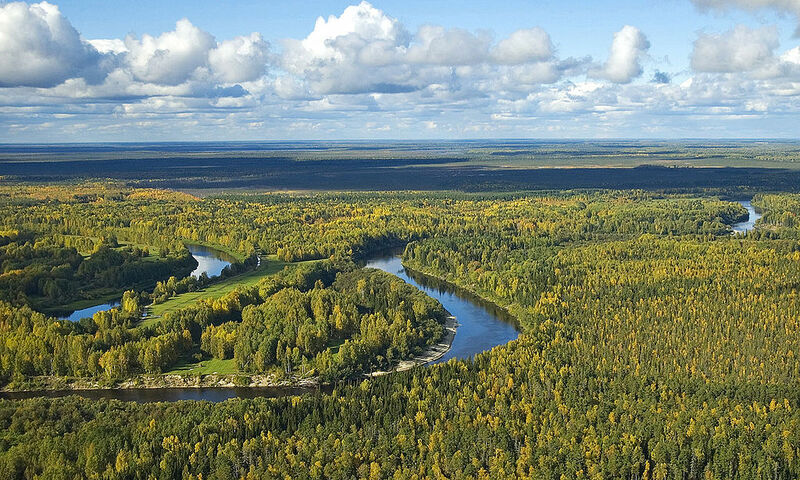 Siberia is the name for central Russia: it is an area covered in pine forests (which Russians call taiga), rivers, mountains, and, during the long winter, ice and snow. This is the landscape you would see from the train window, on our journey through Siberia from St. Petersburg, via the Russian capital Moscow, to Vladivostok. Here is a map of the journey from Moscow to Vladivostok and below is a picture of a typical train that you would travel on. It is painted with the colours of the Russian flag, red, blue and white. What do you think the word Россия on the train's side means? Tip: have a look at our alphabet decoder on the Alphabet page of this site. The journey from Moscow to Vladivostok is over 9,000 km, which is nearly 15 times as long as the distance between Edinburgh and London by train! It lasts 8 days, and takes you through 7 of Russia’s 9 time zones. But who built this railway? How old is it? And why would anyone take on such a hard task? The first railways appeared in Britain in the 1840s, as part of the Industrial Revolution. This was a time when large factories began to replace smaller workshops, and when many people began to move into cities from the countryside. The railways were a quick way of transporting goods—like wheat, coal, wood and iron—from the countryside to the cities, or from one city to another. By the end of the 19th century, when countries like Britain, France, Germany and the United States had already become industrialised, in Russia most people still lived in the countryside and worked on farms. Because of its size and its harsh winters, transporting goods from one town to another by road or river was difficult and costly. The Trans-Siberian Railway was to be a way of speeding up this process, and of connecting the west of Russia with the east. Work on the Trans-Siberian railway was officially opened in 1890, by Tsar Nicholas II, who was travelling in eastern Russia and Japan at the time. Tsar is the Russian word for ‘king’. At that time, Nicholas was not yet king, but a prince, which in Russian is called tsarevich. Below is a photograph of the young Nicholas as tsarevich, and another of him as tsar. It took 26 years before the railway line was completed, but in 1916, you could finally get a train from St. Petersburg in the west, to Vladivostok in the Far East. St. Petersburg is where we will start our journey! St. Petersburg is Russia’s second-largest city, after Moscow. It is in the very north west of Russia and it lies on the River Neva. The beautiful bridges, architecture and canals of St Petersburg mean that many Russians call it the ‘Venice of the North’. You can see one of the canals in the picture below on the left. But St Petersburg's climate is very different from Venice - the picture on the right below shows the river and the university at the end of a St. Petersburg winter, when temperatures drop as low as -30, and the Neva freezes over! 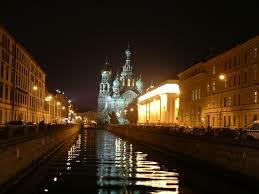 St. Petersburg was founded in 1703, by the Tsar of Russia, Peter I, or, as he is better known, Peter the Great. At the time, Russia was at war with Sweden, and St. Petersburg was the perfect location for a port from which warships could be sent. Peter studied shipbuilding as a young man in the Netherlands, and the city was built around the needs of the Russian navy. 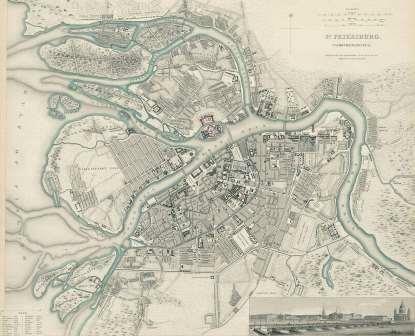 Here is a map of the city in 1834: can you find the Peter and Paul Fortress at its centre? 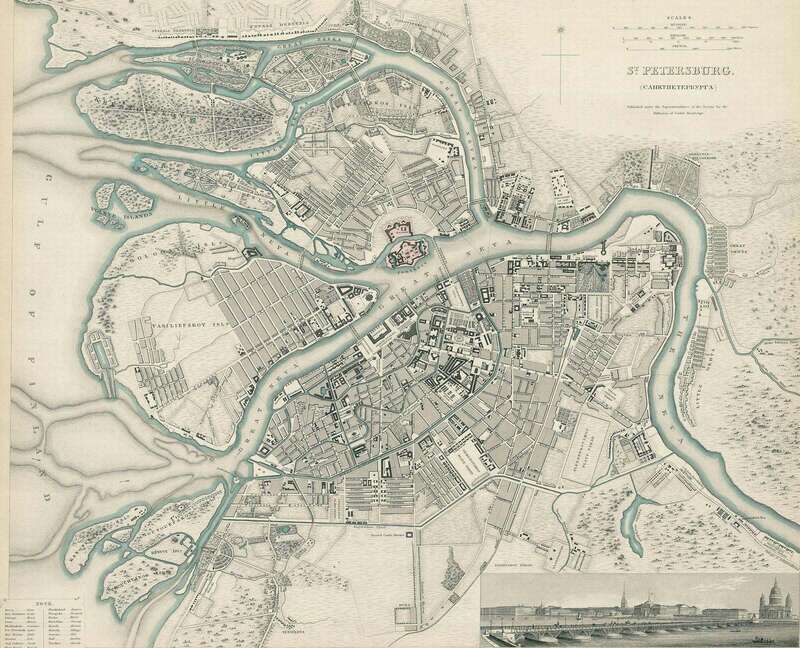 St. Petersburg was not only a military city, though. 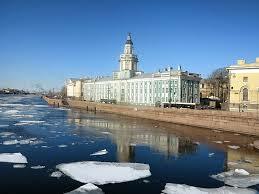 In 1712, Peter made it his new capital, and moved the Russian government from the old capital, Moscow. He wanted St. Petersburg to be a ‘window to Europe’: after travelling in Europe as a young man, Peter had grown sick of what he saw as old-fashioned Russian traditions. This meant bringing European fashions to Russia, ordering officials to learn French, and even cut off their long beards! To the right is a picture of Peter the Great in European dress—without a beard. This painting is by the Dutch artist Johann Georg de Meyr. In the background is the Tsar's Winter Palace, and in the foreground a mix of people. Some seem rich, while others seem poor; some appear to be sailors, while others have jobs in the city itself. It was painted in 1796 and hangs in the Hermitage Museum in St.Petersburg. Hermitage website. You can see more details here. Choose a figure or a group and write a short story, or draw a picture, showing 'what happened next'. 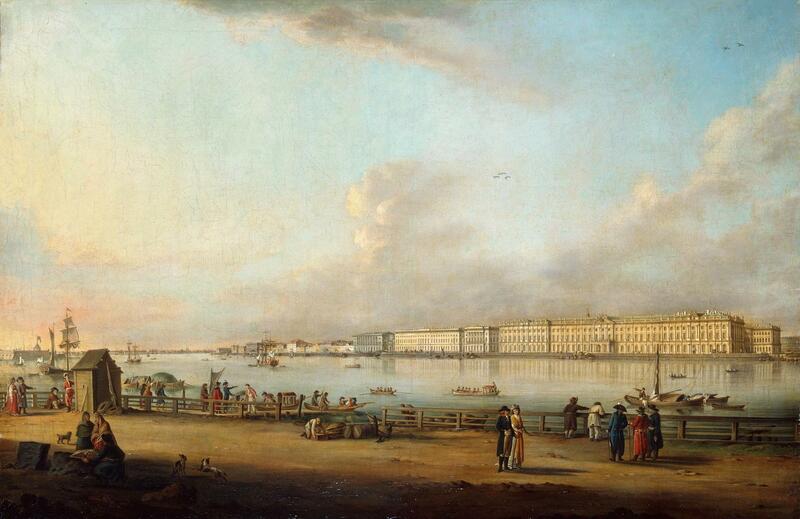 Remember that St Petersburg grew to become a large and bustling city. The more imaginative your story or picture the better! The Bronze Horseman. The inscription reads "To Peter I from Catherine II, 1782"
St. Petersburg soon became the capital of Russian culture, and artists and writers were inspired by its fascinating history and people. One of these writers was Alexander Pushkin (whom you can learn more about elsewhere on this website), who in 1833 wrote a poem about one of the city’s most famous landmarks: the Bronze Horseman. 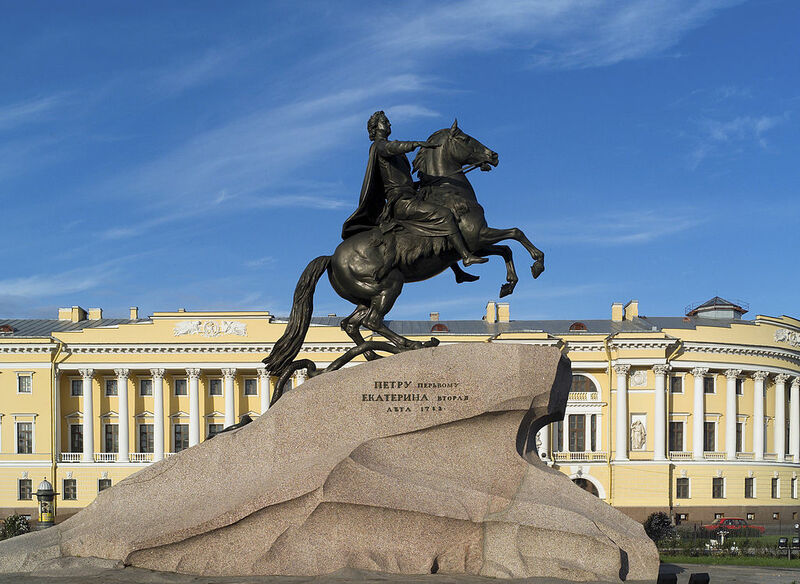 The statue was commissioned by the Empress Catherine II, in memory of Peter the Great. The ruler over half the world. His gaze was visionless in mist. After him the Horseman went." Extract from “The Bronze Horseman” by Alexander Pushkin, translated into English by Antony Wood. Published in “The Penguin Book of Russian Poetry”, ed. Robert Chandler, Boris Dralyuk, Irina Mashinski. Penguin Classics, 2015, ISBN 9780141198309. 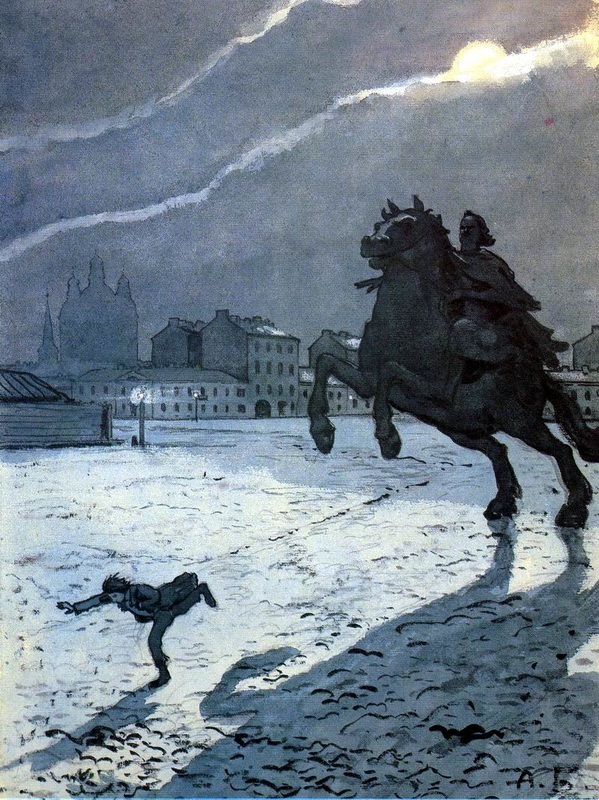 Ilustration to the poem by Alexander Benois. While St. Petersburg may be a beautiful city, many of the stories written about it are full of darkness and magic. Can you write a short poem, or draw a picture like the one above, showing what happened next? Does Evgeny escape the Bronze Horseman, or not? Might there be something else awaiting Evgeny that night? Now the journey begins! Tickets ready, and onto the train. Next stop, Moscow! Moscow has been the capital city of Russia since 1918, as it was before the foundation of St. Petersburg. It is the largest city in Russia, and one of the largest in the world, with over 11 million inhabitants. 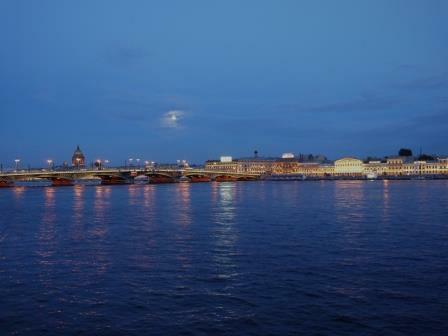 Unlike St. Petersburg, the city has existed since medieval times, and was the capital of the old Russian tsars. To the left is a photograph of the Kremlin, a fortress which has existed since the 11th century and today serves as the Russian parliament building. 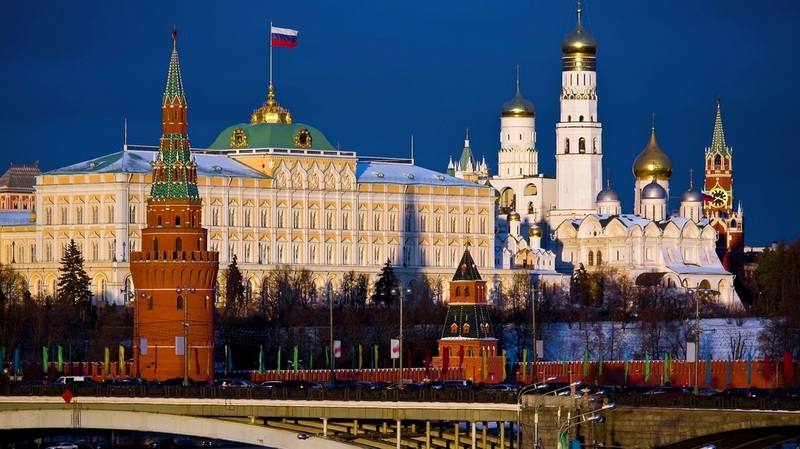 Many of Russia’s most famous landmarks are located in Moscow. One of them is St Basil's Cathedral on Red Square in the city centre, near the Kremlin. 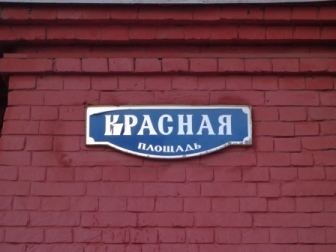 Red Square is Красная Площадь (krasnaya ploshchad) in Russian. The word красная means 'red', but in old Russian it meant 'beautiful' - so Beautiful Square might also be a good translation! 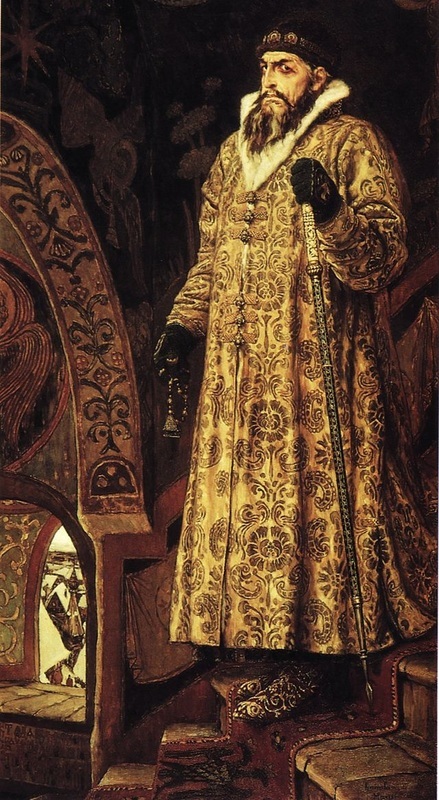 St Basil's was built in the 16th century on the orders of the Russian tsar Ivan IV, or, as he is commonly known, Ivan the Terrible, because of his fearsome manner and ruthless reign. There is more information on Ivan in our history section. 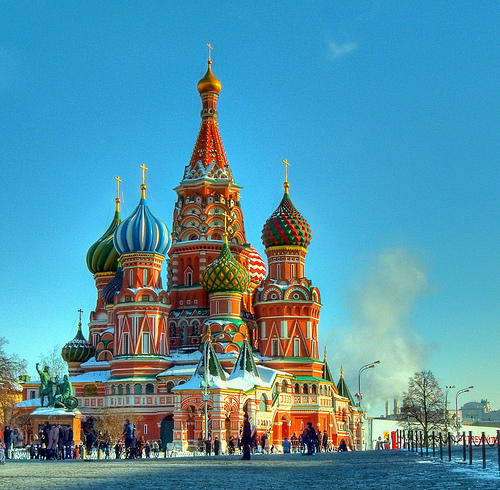 For a long time St Basil's was Moscow’s tallest building, its colourful ‘onion domes’ a display of the city’s wealth and Ivan’s power. The domes also serve another purpose: the Moscow snow falls off of them easily! Moscow is not just famous for old buildings though: it is also a city famous for its culture. Many Russian authors, painters, musicians and poets have lived in Moscow, but the city is perhaps most famous for its ballet. 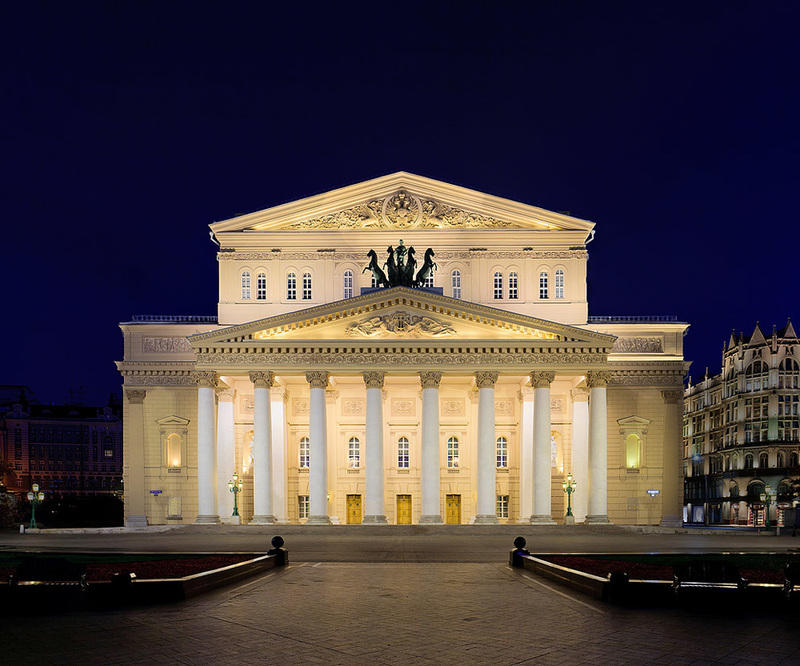 The Bolshoi Ballet (bolshoi means ‘great’ or ‘big’ in Russian) has been Moscow’s premier ballet theatre and school since 1776. It has produced some of the world’s most famous dancers, and many ballets which are still performed today had their premiere in the theatre. Pyotr Tchaikovsky was a composer who worked closely with the Bolshoi, and composed the music for some of their most famous ballets. Some you’ll definitely recognise, like Swan Lake and The Nutcracker. If you click on this picture you can watch a performance from The Nutcracker at the Bolshoi Theatre. The music is one of Tchaikovsky’s most famous pieces, ‘The Dance of the Sugar Plum Fairy’, which is played all over the world, especially at Christmas time. Have you got your luggage and your ticket? Time to leave Moscow and ﻿get on the train to Vladivostok﻿!